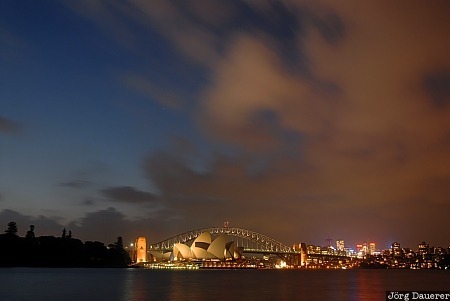 The floodlit Sydney Opera House with the floodlit Harbor Bridge in the background seen at the blue hour just after sunset. Due to the long exposure time of 13 seconds the clouds in the sky are blurred. Sydney is the capital of New South Wales in the east of Australia. This photo was taken in the evening of a sunny day in April of 2007. This photo is part of the exhibition Blue Hour (October 2016). This photo was the image of the month in September of 2012. This photo was taken with a digital camera.